Belgian independent scholar Wael Sherbiny was instrumental in re-discovering the oldest (and longest – at 8.2 ft) Ancient Egyptian manuscript, and the precious document was analysed to be over 4,000 years old. Well this time around, Sherbiny has made yet another incredible discovery, by identifying the oldest depicted demons represented by Ancient Egyptian art. Two of these depicted demons were found on around 4,000-year old coffins, while the third demon was portrayed in a 4,000-year-old leather roll. Now from the textual perspective, many scholars are already aware of how Ancient Egyptians imagined demonic entities in their written and mythological works. But interestingly, this is the very first time that researchers have come across an actual visual representation of at least two of these demons. These three demons are already familiar to scholars from ancient texts. However, the depiction of two of them was unknown until now. The drawings show them in either a purely zoomorphic or anthropomorphic representation. The first of these demonic entities is known as In-tep, and ‘it’ is depicted on a coffin as a baboon-like creature with the size of a dog. The name itself (possibly) alludes to its penchant for bloodthirsty activities, like ripping off heads. The other demon is known as Chery-benut, and its visual illustration (on the coffin) is a bit vague with human visage set atop a unspecified body. Both of these entities are represented as guardians of a massive complex, which possibly pertains to a temple. Incredibly enough, the inner chambers of this ‘temple’ is also shown to be guarded by a slew of other demons. The texts link this building to the moon god Thoth and the bark of the sun god…The name of the first demon, In-tep, may denote his dangerous role in severing heads as a punishment to any intruder of the sacred space. 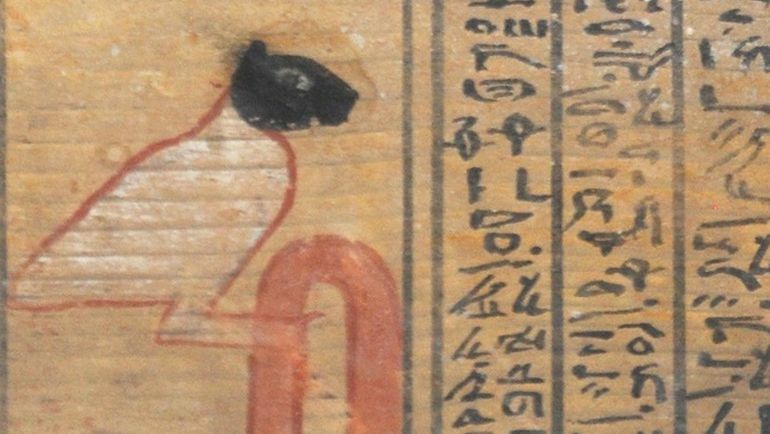 The third depicted on an ancient Egyptian leather roll, pertains to Ikenty – represented in the hybrid form of an imposing bird with a black feline head (pictured in featured image). He is portrayed as a ferocious gatekeeper of an exclusive zone that held a divine image. Ikenty also made his appearance in later periods, specifically on a Middle Kingdom coffin (circa 1870-1830 BC). Now as for their ‘societal’ status, these demons could be both benevolent or malevolent deities. Given their symbolic roles as mostly guardians of important religious precincts, the entities (as they are represented) do rise above the morality-based dichotomy of ‘good and evil’, and rather hark back to the primeval scope of protection and danger. Lastly, as for the historical perspective, Sherbiny was pleasantly surprised that the evolved nature of polychrome drawings of supernatural entities from the New Kingdom (around 3,500 years ago) had their roots to even older art forms. And the good news for Egyptology enthusiasts is that all of these images of the antediluvian demons will be published (for viewing) in a compiled study. The images and the assessment were originally presented at the International Conference on Ancient Egyptian Demonology at Swansea University, U.K.